As it was once hidden for being far-flung from inhabited islands in the Philippines, the quiet but enthralling town of El Nido in Palawan has more than just plants and animals, crystalline blue waters and white sand — each island assures a different experience. At dawn, the best view of a sunrise people could get would be at Miniloc Island, known for its Big and Small lagoons and dive sites with 1.5 meter jacks and over 800 multi-species of fish recognized in Bacuit Bay. On the other hand, the best place for a sunset would be at Lagen Island, which has a resort that is surrounded by a tropical limestone forest birds and mammals have dwelled in even before the resorts were put up. 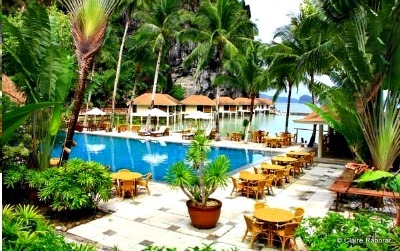 Mariglo Laririt, biologist and president of Ten Knots Philippines, Inc., which operates El Nido Resorts, said that each island had its own set of environmental officers that monitored the animals and made sure they were protected. Dubbed an eco-luxury hideaway, Pangalasian Island has views of both sunrise and sunset and a 750 meter stretch of white sand beach can also be found there. For those in search of an eco-adventure, the Apulit Island located in Taytay, Northern Palawan is where one should go wherein the sprawling resort has a wide expanse of white-sand beach lined with coconut palm trees. A relatively small tavern is made from hollowed out rock in Pinasil Island, which is accessible only by dinghy or kayak, although the latter is recommended on calm seas. From within the comforts of a beach club is Dibuluan Island, which can be hiked to for a great view. The Inner Bay Trail is along a coconut grove, bamboo thickets and banana shrub and ends in a small mangrove forest. Vigan Island or Snake Island is known for its natural sand spit and S-shaped sand formation. Also found there are pitcher plants, iron wood, the view of the entire bay and dogs who visit on occasion, as the island is connected to mainland. Cadlao is the largest island in Bacuit Bay and its peak is the highest at 609 meters above sea level. The island itself looks like a laughing man as Cadlao in Cuyunon (a native Palawan language) means “laugh”. Of course there are other islands like the Dilumacad, Entalula, Paglugaban, Pinagbuyutan, Tapiutan in Palawan which could take more than one day to visit all of them entirely. Miniloc Resort Manager Noel Barrameda said that although it did get lonely sometimes, as being “overseas” in different islands, not abroad felt that way sometimes, the magnificence of the island would make anyone feel right at home in a couple of days, making it difficult for anyone to leave--almost as if the island itself has placed some sort of enchantment of tourists, making them want to stay longer. Although El Nido might not offer the same as the island of Boracay when it comes to living the nightlife or mighty wave-surfing like in Pugudpod, the quaint island of El Nido gives tourists more laid-back things to do.